The Source Audio Programmable EQ is a thoroughly modern and highly streamlined upgrade to traditional equaliser pedals. This compact, rugged, cast aluminium stompbox provides quick, hands-free access to four different user programmed EQ settings. Whatever your instrument, playing style, or genre, the Source Audio Programmable EQ is the essential tone-sculpting tool for your live rig. 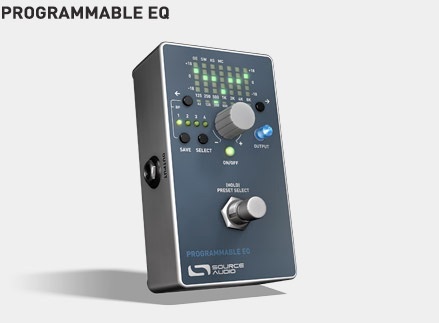 The Programmable EQ packs plus or minus 18dB of range over seven frequency bands, plus an additional frequency band at 62Hz, accessible via the Octave Extend function. Engaging the Octave Extend systematically optimises the pedal’s frequency spectrum to accommodate the specific frequency range of the bass. Once you’ve dialed in the desired guitar or bass tone, save it in one of four programmable user pre-sets. Each pre-set is easily accessible via the hands-free footswitch scrolling function. Simply hold down the footswitch and let the pedal scroll through each pre-set at an adjustable rate – release to engage. The pedal’s MIDI input also provides remote access to user pre-sets or engages/disengages the effect. Run a MIDI signal from your POD, Eventide Space reverb, TC Nova System or any other MIDI compatible multi-effects unit and vastly expand your tone horizon within each pre-set. •+/- 18dB range over seven frequency bands. •Four independent programmable user pre-sets easily recalled via the Footswitch. •Octave Extend Function: optimises the EQ for bass with an additional freq band at 62Hz. •Small Footprint: A compact, rugged, cast aluminium housing. 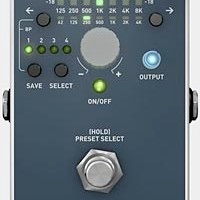 •Auto-scrolling function: automatically scrolls through all four pre-sets to create unique and dramatic effects similar to sequencer or tremolo units. •Hardwire “True” Bypass: utilises a small-signal relay for improved reliability and remote switching capabilities. •MIDI input: recall pre-sets, engage/bypass remotely via MIDI. •State-of-the-art DSP — our proprietary 56-bit Digital Signal Processor, the SA601 and crystal-clear 24-bit converters. •Runs on a 9V battery (included) or power supply (not included).